Achieving very high levels of net use: Hang-up follow-up in Ntcheu, Malawi. In Ntcheu, Malawi we conducted the first of the regular 6-monthly Post-Distribution Surveys to assess net use and condition. We found very good results with net hang-up high at 90% across the population of 550,000 people. For 27 of the 37 areas that make up the district the hang-up rate was a very high average of 95% (range: 91-98%). For 10 districts the average was 84% (range 78-88%), 11 percentage points lower. AMF and Concern Universal (CU) both believed it possible to increase the hang-up rate in the 10 areas by 10 percentage points through additional, structured malaria education and hang-up activities with full involvement of the local communities. These activities took place between 23-27 Sep 2012. We expect to receive, and will publish, updated hang-up data for these 10 areas by the end of November 2012. The reason for this additional low-cost intervention was to seek the optimal impact of the nets distributed. In the 6-months Post Distribution Survey, 7,646 randomly selected households were visited and 15,735 nets surveyed. Survey questions covered net use and net condition for both AMF and non-AMF distributed nets. The survey was carried out by staff from each of the 37 health centres and clinics in Ntcheu, with training and supervision by CU staff. The data was collected on written forms and entered by CU staff into a database to facilitate analysis. The data is available on the AMF website. 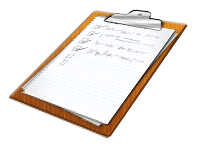 A number of independent charity evaluators review causes and individual charities and make their own giving recommendations. We have just published a page showing 'What people say about us' and how they rate us in comparison to other charities. We continue to make public, information and data behind the workings of AMF. 1. 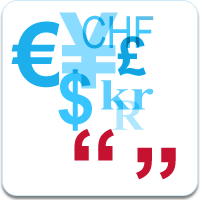 Annual accounts – what we file. 2. Easier-to-understand accounts - our audited annual accounts with additional detail added and laid out in a way we believe is clearer than formal accounts. Status and implications of mosquitoes developing resistance to the insecticide used in LLINs and mosquitoes changing their biting time to early morning. Mosquitoes developing resistance to the insecticide used in long-lasting insecticidal nets (LLINs) and mosquitoes changing their biting (feeding) behaviour and biting not between 10pm and 2am but towards the early morning ie 5am - or rather, in both cases, natural selection occurring favouring those mosquitoes that develop some level of resistance or having a later biting time - is starting to be seen. The extent to which either or both of these factors become a major problem for the effectiveness of LLINs is currently not clear. Currently both issues - resistance to pyrethroids and changed time of biting - are not widespread. 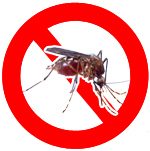 Currently LLINs remain highly effective in reducing the incidence of malaria. It is perfectly possible either or both – resistance to pyrethroids and changed time of biting - will remain a relatively minor problem without widespread impact. It is also perfectly possible, over time, either or both - resistance to pyrethroids and changed time of biting - will become a material issue. This is the more likely scenario. Resistance has been seen in other areas so it would not be a great surprise to see resistance developing to an insecticide. For example, the malaria parasite (rather than the mosquito in this case) first showed resistance to chloroquine in the 1950s and more recently, in 2004, evidence of resistance to Artemisinin Combination Therapy (ACT), the primary drug currently used to treat malaria. This highlights the importance of meta-research studies that look at both these issues - resistance to pyrethroids and changed time of biting - in many more locations to both establish how prevalent the problems are and to monitor developments. This is a very important time for research so we gain clearer information that can influence decisions. A solution to mosquitoes developing pyrethroid resistance is the use of non-pyrethroid insecticides. Currently there aren’t any that can be used on nets. Significant research is being carried out by a variety of groups and organisations to develop such insecticides. No-one can give a clear timeframe or the chances of success although some in this research area suggest a three to ten year timeframe is likely before products are able to come to market given the strict testing of such insecticide-including products. In 2010, a net incorporating a second chemical, referred to as a synergist, was introduced to the market. There is some, but not conclusive, evidence that the combination of the pyrethroid and the synergist is more effective than pyrethroid-only nets at achieving knock-down of mosquitoes developing pyrethroid resistance. Further research studies, including field studies, are currently underway. More are required. The conclusion currently therefore, is there is no clear indication that the synergist treated nets are the nets of choice for areas where resistance is indicated, or indeed for other areas to prevent resistance developing. However, they do show promise and they might prove to be better than non-synergist-including nets. The synergist treated nets are currently 30% more expensive than the pyrethroid-only treated nets. A solution to mosquitoes changed time of biting is less clear, as is the extent of the problem. There is an interesting article that discusses some of the current factors that may influence how serious, or not, a problem this becomes. 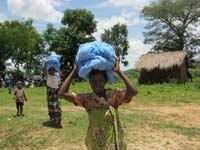 Long-lasting insecticide treated nets (LLINs) remain the most effective means of malaria prevention. More research needs to be funded to understand the extent of problems such as mosquito resistance to the insecticide used on nets (pyrethroids) and change in time of day of biting of some mosquitoes. Research into both non-pyrethroid insecticides and chemical combinations (with pyrethroids) is very important. Giving What We Can appeared on the BBC's Daily Politics show and this short video explains their philosophy. There are some interesting numbers in there from the start (and at the end!). Past the $12 million mark! 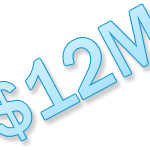 We have just passed the $12 million mark! Thank you to Simon from Melbourne, Australia who has just taken us past that milestone. Every donation from every person counts as the total of $12,011,000 from nearly 52,000 donations and transactions, in 168 countries, indicates. 100% buys nets. That's 2,780,528 nets, protecting more than 5 million people.